In my only attempt at racing, I, embarrassingly enough, caused a qualifying session to be red flagged. We shall not dwell on how I managed this tremendously distressing feat, nor on where I finished the race (suffice it to say I wasn't last), but instead move on to the immediate aftermath of the incident. Indeed, after a sufficient measure of time had passed with me beached in the racecar by the side of the track, I trundled back into the pitlane prepared to be admonished sternly. And while I developed a nervous tic as the men in the steward's room contemplated my fate, there was a tap on the driver's side door and the familiar face of Rayomand Banajee poked his head in saying 'What are you waiting here for? Go on, there's only five minutes left!' And with that he waved me on to complete my shot at qualifying. Later that evening Rayo sternly wagged a finger at me and gravely stated, 'You must always know the rules. Don't just listen to what the stewards tell you,' even as the amused Clerk of the Course looked on, all the while insisting that I had, ahem, been in the wrong. To Rayo, it didn't matter that I was competing in what was supposed to be a friendly, one-off race. Racing was racing. And it was all very serious business. It's these thoughts that are floating around in my head as I wait for Rayo to show up for the interview. 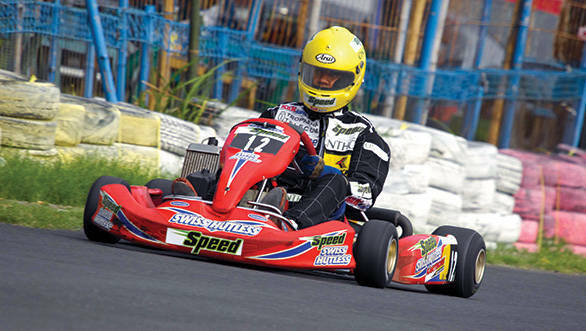 Also wafting around in my head is the image of a racer clad in black overalls and a yellow helmet, purposefully striding across the karting track at Kolhapur at the final round of the JK Tyre National Karting Championship in 2008. 'Rayo is a master strategist,' chuckled the old hand standing next to me waiting for the race to begin, his laugh an indicator of the treat we were in for. You see, we were about to witness a spectacular display of karting prowess and thorough knowledge of the sport go hand in hand. Rayo had headed into the final round of the karting challenge with a total of 330 points and a slim lead over his nearest placed rivals. If there was a full grid, and either Karan Goenka or Rounak Patil were to finish ahead of him, full points would be awarded and one of them would pip him to the title. However, if the grid wasn't full, only half points would be awarded and the championship would fall merrily into the hands of the aforementioned master strategist. Suddenly my thoughts are interrupted when the man in question walks in and our interview begins. Doesn't look too pleased with third place, does he? It was 2000 before the opportunity to rise to the challenge arrived, though. 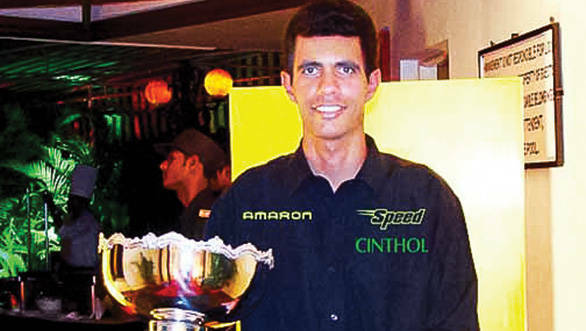 A karting team had sprung up in Bombay and Rayo, in his own words, was 'hell bent' on getting into the team. So one Sunday, after watching Rubens Barrichello win his first ever Formula 1 grand prix on the telly, Rayo hopped on his scooter, bid his somewhat startled parents farewell and rode the 150-odd km from Pune to Bombay to try out for the team. He'd been informed that if he managed to break the lap record at the Hakone track, he'd find himself a member of a thoroughly professional race team. Of course, that's precisely what he did. As luck would have it, though, the team folded just before the karting season began. But the bug had bitten and for Rayo there was no looking back. 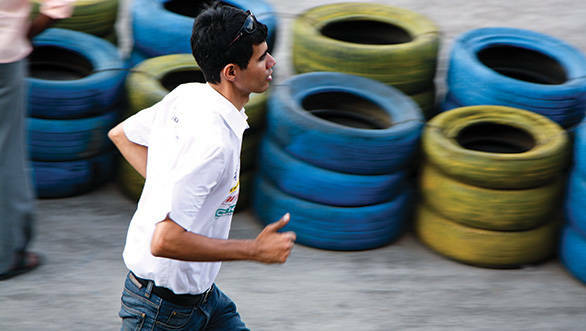 He'd already taken the first steps towards becoming a name synonymous with Indian karting. And so the journey began - racing on a shoestring budget. 'If you're competing in a national championship, you're entitled to a 75 percent discount on train fare in the sleeper class,' Rayo declares. An entitlement he's sure is still available, if only people would bother to find out. He'd also stay in a Parsi dharamshala in each city he went to and take his scooter along with him to make commuting to and from the track easier. So he'd manage travel and stay to an event in under Rs 900, but what sweetened the deal was this: 'If I won a race I'd get Rs 10,000 to 15,000 minimum,' he says. All of which could be pumped right back into furthering his career. 'Perseverance, mental toughness and the willingness to work hard,' Akbar Ebrahim says very promptly when I ask him what it was that made Rayo such a special driver. 'He probably wasn't the driver with the most natural flair, but he had a never-give-up attitude and always put in 200 per cent of the effort required,' he goes on to say of the driver he mentored during his early days in karting as a part of the Advanced Driving and Corporate Academy. And the examples of these qualities are plentiful. 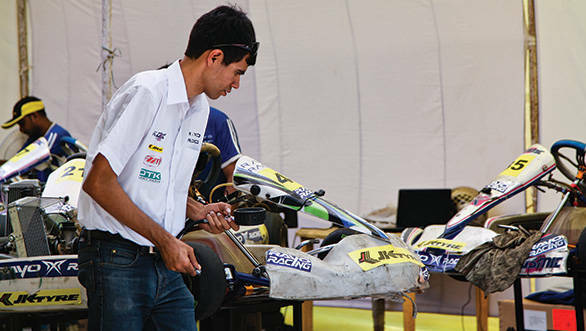 One race weekend in New Delhi, at the 2004 edition of the JK Tyre National Karting Championship, the surface of the track had begun to break up. The good folk at JK, never the sort to let such follies get the better of them, relaid the track overnight. It was decided that qualifying would be held in the morning, while the races would be held at night. As it happened, Rayo qualified sixth on the grid, was duly written off by the competition, and was content to go about the rest of his day rather quietly. And it was quietly that he made his way on foot around track before the start of the races, the lone driver to do so. Good thing too, because he discovered a rather startling fact. Some time after qualifying, the contractor had gone right ahead and coated the nice and grippy freshly tarred track with powder - perfect for when you tar public roads, but certainly not suitable for a racetrack. The result? No grip. Luckily for Rayo though, he'd spotted the bits of track that were most usable and modified his racing lines accordingly. 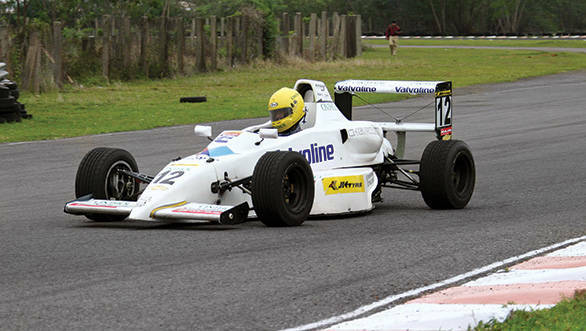 He won the first race, and was so quick in the second that he lapped everyone up to the third-placed driver. 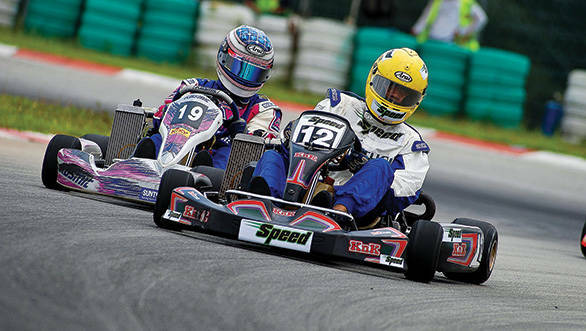 When his kart started giving up, he coasted to the chequered flag still well ahead of the rest! There was another time, also in 2004, when he found himself piloting a kart that would not turn when he wanted it to. Given the fact that he'd started the race on pole, he was fuming that he lost because of something he could not comprehend. When he was informed that his kart was behaving badly because of a slow puncture to one tyre, he was skeptical. But instead of letting his suspicion get the better of him, he returned to the track the next day, had the very same kart prepped as though for a race, simulated race conditions and then set off. In due course of time, the errant tyre started losing pressure once again, and the kart refused to comply. This time, Rayo carried on, determined he'd learn to overcome the situation, should it ever occur again. 'I began to flick the kart from side to side, before throwing it into a corner and managed to complete an entire race distance like that,' he laughs. 'Whatever the obstacle, you simply have to learn to overcome it,' he says, and it's evident that he applies this to all aspects of life - on track or off. But the full extent of Rayo's passion for racing lies in the fact that he'd never miss a race, come what may. Even, as it so happened one time, if there were two different events being held on the same day in two different cities. 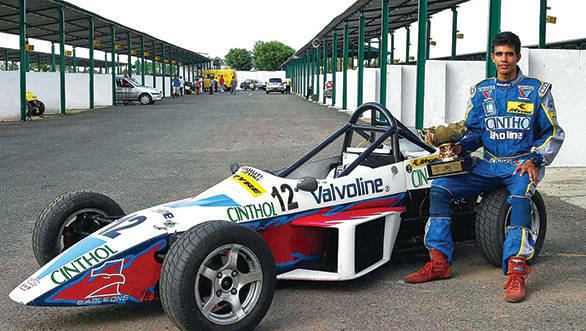 'I'm possibly one of the only drivers to have done this,' he gleefully declares as he begins to tell me about the time that the final round of the 2003 Formula LGB championship in Chennai coincided with the final round of the MAI Karting Championship in Bangalore. A sane driver might have opted to only compete in one. And Rayo, it would appear, had a firm streak of madness running in him. 'I reached Bangalore on a Tuesday and learned the track by practicing in the track karts, then headed to Chennai by train and got in a few practice laps in the FISSME on Thursday. Then I took a night train to Bangalore for Friday practice in the official karts, took a train back to Chennai, completed qualifying in the LGB, flew to Bangalore for the karting event where I set the second fastest time in practice. A final train journey to Chennai for the race, in which I finished third, before flying to Bangalore for the karting round.' As luck would have it though, a problem with his kart would ensure he wasn't able to get beyond the second corner, and his championship was lost then and there. 'I've had some rubbish luck,' Rayo states with a wry smile. Then he goes back to talking about how his idol Ayrton Senna, and even the likes of Michael Schumacher and Sebastian Vettel, were so technically sound and proficient in terms of racecraft because of their knowledge of the machines they were piloting. 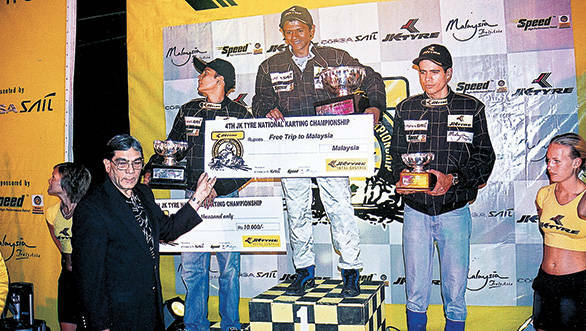 Which is why, after he wasn't able to race in a round of the Asian Championship in Malaysia due to the fact that he didn't have the requisite license, he stayed on and served as a mechanic for Asian Formula 2000 winner Wai Leong. So impressed was the driver with Rayo's dedication that he asked him to stay on for two months and took him under his wing to mentor him - it's where he learnt the most about karting and, he declares, life as well. It's likely the combination of all of these factors that made Rayo the formidable rival he was to his opponents. 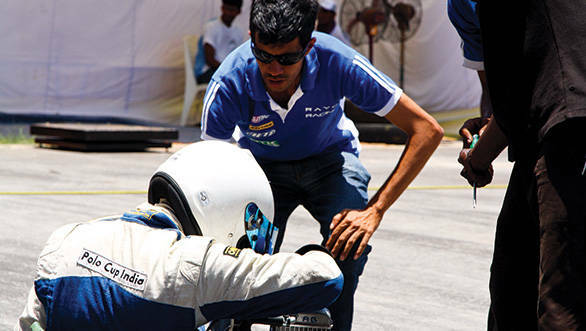 Ameya Walavalkar, himself a five time National Karting Champion, who also has two national racing titles under his belt, remembers Rayo as a driver thoroughly adept at racecraft, and one whom he enjoyed a healthy rivalry with. However the memory that stands out for him the most is of the time he crashed at the Madras Motor Racing Track, breaking both his legs and ending up in the hospital. 'Rayo stayed with me at the hospital all night because there wasn't anyone else to help me out. He's a great guy,' he says of his canny on track nemesis, off track friend and overall good guy. Despite his six national karting titles and two Formula racing titles, Rayo never managed to make it to the big league abroad - he still remains the only Indian to compete in a KF1 championship, though. But contributing largely to his status as Indian racing's almost man, is a lack of funds. Indeed, he remembers testing the Formula BMW in 2006, alongside a certain Daniel Ricciardo. 'When we looked at telemetry data we saw that there were some corners where I was actually quicker than him, but it didn't mean anything back then. Today that chap's in Formula 1,' he grins. Moreover, when Rayo started racing it was at a time when Indian motorsport wasn't at its most organised. 'The structure required for someone who was talented to be taken through the appropriate rungs of motorsport wasn't in place,' says Nazir Hoosein, President of the MAI. But Rayo's not one to dwell on ifs and buts, especially after a sage piece of advice he received from Sanjay Sharma, JK Tyre's Head of Motorsport. A polite version of which loosely translates to 'If your aunt had cojones, she'd be your uncle.' It was Sharma who gave Rayo another crucial piece of wisdom when he told him to quit racing. 'At that point, I had won everything there was to win in the national racing scene,' he says. The realisation also soon dawned that if he couldn't manage to get Rs 50,000 from sponsors for the national championship, getting them to cough up a crore for Formula BMW would be impossible. And so he hung up his helmet and took to training the next generation. 'Racing should come first. Everything else should be secondary,' Rayo says of what he expects from the young karters who form a part of the Rayo Racing team. You see, Rayo Racing is a thoroughly professional outfit, owned by Rayo himself and ably managed by Steve Hodges, himself an accomplished karter. 'He's the first one at the track and the last to leave, and his dedication and passion are vital to taking the team forward,' Rayo says. All the members of the karting team have been sifted out of Rayo Racing's four-stroke karting programme. If you're so inclined, you can sign up for the programme, progress through the levels of training, and, if you prove your mettle, get snapped up to be a part of the racing team. Just being trackside at the JK Tyre-MMS Kart Open 2013 leaves us gobsmacked - you can tell things have come a long way since Rayo himself karted. We're also quick to notice that attempting to kart at a professional level is not for the faint of heart. You see, when Rayo was trained by Akbar Ebrahim, he noticed Ebrahim's philosophy of 'If you can't take what I dish out, you can't handle what racing will throw your way.' And it's something that has stuck with him since, because he says it's as true as can be. Thus, the drivers in his racing team have to be fit, disciplined and take their racing very, very seriously. It seems to be working though. Jehan Daruvala, who at the tender age of 10 told his father he simply had to attend the karting training programme (despite the fact that he'd never karted before and in spite of having exams the following day) because it was 'a question of my whole career!' has gone on to win the 2012 CIK FIA Asia Pacific Championship trophy. The young karter is now a part of Sahara Force India Formula 1 Team Academy. 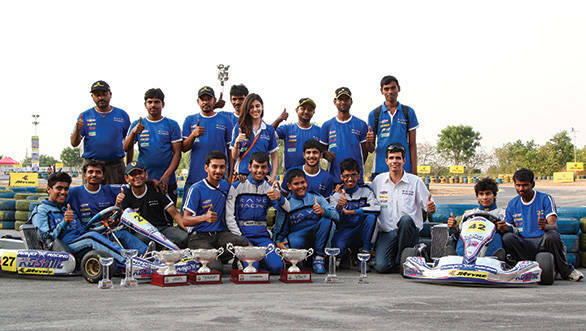 Arya Gandhi and Raj Ganatra took home the silverware in the Asian Kart Open championship in 2011. And the team's other drivers are busy winning everything in sight in the domestic racing scene. But, we've warned you already, this is serious stuff. 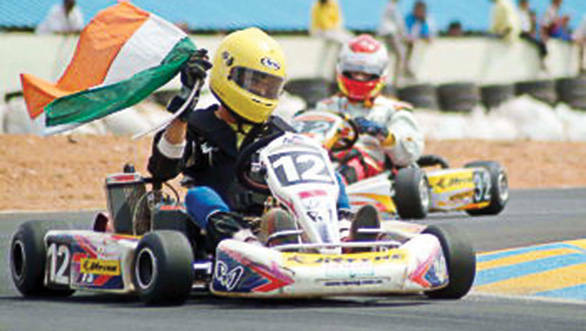 Just ask 2012 National Rotax Karting Champion Ameya Bafna, whose hair happened to get in his eyes while he was driving. Off to the barber he was marched where his head was shaved clean. When he won his first race in the championship though, Rayo returned the favour by going bald himself. It's tough stuff, the karting business, but the karters in the programme are all in it for the long haul. 'Today I can proudly say I'm racing for one of the best teams in India under the best driver coach in India,' says a cheerful Bafna. And perhaps it's he who sums it up best when he declares 'Rayo Racing is not only helping drivers in India, but also developing Indian motorsport.' Mission accomplished, then.